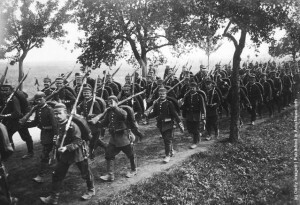 German infantry preparing for war. In Britain around 6 million men were mobilised, and of those just over 700,000 were killed. That’s around 11.5%. Or to put it another way 88.5% survived. In fact, as a British soldier you were more likely to die during the Crimean War (1853-56) than in World War I. 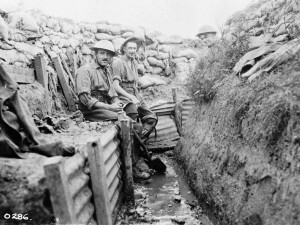 As well as being an extremely hostile environment to live in front-line trenches were often wet, cold and exposed to the enemy. Units would’ve therefore quickly lost their morale if they’d spent too much time in them. As a result, the British army rotated men in and out continuously. Between battles, a unit spent perhaps 10 days a month in the trench system, and of those, rarely more than 3 days right up on the front line. It was not unusual to be out of the line for a month. Not entirely true. Naturally, some generals were not up to the job, but others were brilliant, such as Arthur Currie, a middle-class Canadian failed insurance broker and property developer. ‘Lions led by donkeys’ is a phrase often trotted out to decsribe the Generals. This saying was supposed to have come from senior German commanders describing brave British soldiers led by incompetent old toffs from their chateaux. In fact the incident was made up by historian Alan Clark. Not true. 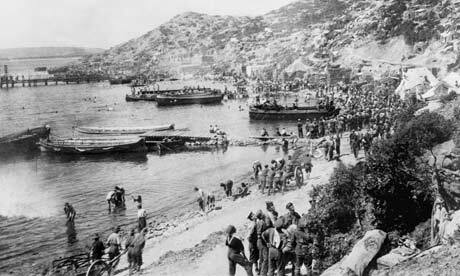 In fact far more British soldiers fought on the Gallipoli peninsula than Australians and New Zealanders put together. Britain lost four or five times as many men in the brutal campaign as her imperial Anzac contingents. The French also lost more men than the Australians. This misconception probbably comes about as the Aussies and Kiwis commemorate Gallipoli ardently, and understandably so, as their casualties do represent terrible losses both as a proportion of their forces committed and of their small populations. 5. Tactics on the Western Front remained unchanged despite repeated failure. Again not true. Never have tactics and technology changed so radically in 4 years of fighting. It was a time of extraordinary innovation. In 1914 generals on horseback galloped across battlefields as men in cloth caps charged the enemy without the necessary covering fire. Both sides were overwhelmingly armed with rifles. Four years later, steel-helmeted combat teams dashed forward protected by a curtain of artillery shells. Furthermore they were now armed with flame throwers, portable machine-guns and grenades fired from rifles. Above, planes, that in 1914 would have appeared unimaginably sophisticated, duelled in the skies, some carrying experimental wireless radio sets, reporting real-time reconnaissance.